In India, Google AdSense payments are primarily made via checks. People familiar with the payment process know how complicated and time consuming it is. Checks are sent to the publishers’ addresses via postal services such as mail or courier, all the way from the US. This involves multiple factors like address mismatch, delivery issues, non-availability of receiver, and others may lead to delay in delivery and return-to-origin cases. This, in turn, spawns negative feedback from the publishers. The checks that don’t get delivered need to be re-issued later; and it’s also a headache for Google. The hurdles aren’t over even when the checks finally reach the respective publishers. Once the check is deposited to the bank, it could take another 2 to 3 days to process depending on your bank. Overall, it takes about 5 to 6 weeks or more to complete the entire process, from the day a check is issued to the day when the payment is finally credited to your bank account. Check payments have thus proven to be difficult for both the publisher and AdSense team. Fortunately though, this situation is about to change. Google AdSense team is currently testing wire transfer payments, and soon all Indian publishers will be able to receive payments via wire transfer. However, this is a new payment system and hence, publishers may face various issues with it. In this context, we’ll try to list down some common questions frequently asked by our fellow Indian publishers. 1.1 Why EFT is not available for India? 2 How to enable wire transfer payment option? 2.1 Can I revert back to check payment system after trying wire transfer? 2.2 Check issued but not received yet. Can I switch to wire transfer now? 2.3 What is the minimum payout threshold for wire transfer? 2.4 When will I receive my payment? 2.5 Is PIN verification mandatory after wire transfer upgrade? 2.6 Are there any test deposit instructions for wire transfer? 2.7 Does my bank support wire transfers in USD? 3 What are the required details for setting up wire transfer? 3.1 Where to get these details from? 3.2 Which SWIFT code should I use? 3.3 Are intermediary and other optional details necessary? 3.5 Can I change my payment settings in AdSense? 3.6 Should payee and bank account holder name be the same? 3.7 Do AdSense and bank addresses need to be identical? 4 What are the fees charged for processing wire transfer payments? 5 Which is the best bank for receiving wire transfer payments? A wire transfer is an electronic funds transfer method by which payments are sent directly to the publishers’ bank accounts. Payments are originally made in US dollars or Euros and sent via international wire transfer to their preferred banks. These payments are then converted to their local currency and credited to the publishers’ accounts. In EFT, payments are deposited to the publishers’ bank accounts directly in their local currency. Hence EFT is a faster and more simplified payment method compared to wire transfer. Why EFT is not available for India? Even though EFT is the most suitable payment method for AdSense, it is not available for all countries at this moment. This is because it requires much more work to be done for each country individually. Wire transfer is the closest alternative to EFT when it comes to convenience and speed. It can also be quickly implemented across many countries within a short span of time. 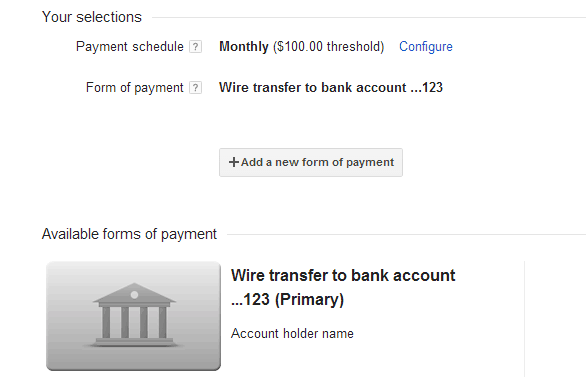 Thus, Google is rolling out wire transfer in areas where electronic form of payments is not available yet. Once all the publishers have been switched to the new payment system, Google plans to start working on EFT payments in India. How to enable wire transfer payment option? Google initially enabled wire transfer payments for 15 AdSense publishers (Beta 1) from different parts of India. After a successful implementation, the official AdSense team announced an opt-in program (Beta 2) for interested publishers. When Google is done experimenting with various banks across India, it plans to roll out wire transfer payments to all Indian publishers. For more details, check out the official announcement thread. Can I revert back to check payment system after trying wire transfer? No, once your account has been upgraded to wire transfer payments, you cannot go back to check payment system. Check issued but not received yet. Can I switch to wire transfer now? Switching to wire transfer does not affect any check payments that have already been issued. If a check has been issued before opting in for wire transfer, it’ll be delivered to your specified AdSense address and you can deposit the check to get it cleared as usual. You would start receiving wire transfers payments from the next cycle onwards, provided your earnings are above the minimum payment threshold. What is the minimum payout threshold for wire transfer? The minimum threshold for AdSense payments remains the same as before. Regardless of the payment system (check or wire transfer), the minimum payout threshold remains at $100. You may also set your own threshold value greater than this minimum amount. In the beta phase, payment processing may be performed anytime during the month. But henceforth, wire transfer payments will only be processed after the 20th of a month. Initially, your payment will be in the PIP (Payment in progress) status. This status indicates that Google has started processing the payment, but is yet to be issued. Once in PIP, your bank will receive the payment (in USD) from Google within 72 hours. But for additional processing (such as USD to INR conversion, calculation of service charges to be deducted and other factors), the finalized amount should be credited to your account within 1 to 3 business days, depending on the bank. So, provided your current balance is above the payment threshold at the end of April, you can expect to receive the payment for the same within 26th of May. You may consult your bank regarding its payment processing schedules. Is PIN verification mandatory after wire transfer upgrade? Google AdSense team uses PIN verification to verify your address when you join the AdSense Program. So, if you have already completed the PIN verification process, you don’t need to do it again. However, if you haven’t completed your PIN verification, you would still need to complete it after upgrading to wire transfer. Additionally, new users would still need to complete PIN verification even if they register for wire transfer payments. Are there any test deposit instructions for wire transfer? No. Unlike EFT, there’s no test transaction to validate the instructions provided by you. If the details provided by you are invalid, you’ll be notified about it soon. You may update the required details and wait for Google to send over the payment again. In case the payment details accidently match with that of an existing bank account (not belonging to you) and if the payment goes through successfully, there’s no way for you to undo the payment in such a situation. Does my bank support wire transfers in USD? Only the bank can answer that question. Speak with the bank officials or a customer care executive regarding this. What are the required details for setting up wire transfer? Where to get these details from? Most of the information required for a successful wire transfer payment can be obtained from your bank’s official documents. Account holder name, Account number and Bank name are available on your passbook or net banking account. IFS Code (IFSC) can be obtained from checkbook. Regarding SWIFT Code / BIC, Google recommends that you directly contact your bank for information. Even bank officials may sometimes provide incomplete information about SWIFT codes, which may be confusing, so make sure you verify the information from multiple sources (like bank’s website, customer care, etc.) about the SWIFT (if any) code used by your bank-branch. Which SWIFT code should I use? A SWIFT code is a bank identification code used for international fund transfers. Banks use these codes to send cross-country payments. Local banks on the receiving end then convert these funds to the local currency and forward them to the corresponding accounts. SWIFT code is mandatory for processing international payments via wire transfer. If a bank doesn’t have a SWIFT code, it may use another bank’s services for the same, or may not support international wire transfer payments at all. Usually, every bank in India will have a primary branch dedicated for handling payments on behalf of all of the branches. So regardless of whether your branch has SWIFT code or not, the primary branch code will also work (if your branch supports wire transfer) for you. Some SWIFT code-enabled branches process payments only in local currency (INR) or a limited number of foreign currencies. Hence, for receiving AdSense payments via wire transfer make sure the SWIFT code you’re using belongs to a branch supporting wire transfers in USD. If there are multiple SWIFT codes used by your bank, you may use any one of them in the AdSense wire transfer instructions. But depending on the SWIFT code used, the payment processing time may vary. You may choose the SWIFT code of the nearest possible branch for faster processing, or consult with your bank for your best option. If you use a SWIFT code that hasn’t been recommended by your bank, you may see higher deductions from wire transfer payments; the bank may charge you an additional $10 – $20 if a non-recommended code is used. Usually, SWIFT code of your bank’s Foreign Exchange Department is more suitable for wire transfers because it usually imposes minimal service charges for the process. Are intermediary and other optional details necessary? The bank used by Google for sending wire transfer has the ability to automatically look up these details required to properly route most payments, and so you need not provide the intermediary bank information and other optional details. It is recommended that you should leave it blank for now. If you face any issues while adding wire transfer instructions or receiving your payment, you can get in touch with your bank later and provide the intermediary bank information accordingly. Sometimes, when processing your payment conversion, your bank might ask for the Purpose Code for your AdSense payment. According to the Reserve Bank of India, all wire transfer payments issued by Google to India falls under a Purpose Code of P1007 (Advertising, trade fair, market research and public opinion polling services). For more information on Purpose Codes, visit the official page from RBI’s website. Can I change my payment settings in AdSense? Add a dummy form of payment with a different bank account in Payment settings. After the new payment form has been added, set it as primary. Now remove your original payment form (which you want to modify). Add a new form of payment again, this time with the correct bank details. Set this as the primary and delete the dummy payment form. The AdSense team has confirmed that they are working on UI improvements which include an editing option for SWIFT code in an existing form of payment. Additionally, in order to receive payments within the same month, all payment details must be updated before the 20th (earlier it was 15th) of that month. Should payee and bank account holder name be the same? Yes, your name as listed under the payee profile should match the name on your bank account; otherwise, your bank may delay or decline processing of your payment. So, the Account Holder Name provided in the Payment Settings page of your AdSense account should also coincides the Payee Name of your Payee Profile. It is quite similar to providing the same payment and billing details when setting up your account for a web hosting service. Here, the payee profile of your AdSense account corresponds to the billing details for your web hosting service, while bank account information corresponds to the payment details. In other words, you may not provide another person’s payment details in your AdSense account. Do AdSense and bank addresses need to be identical? Sometimes, the address in your AdSense account may be different from that provided in your bank records. Google hasn’t mandated it to use the same address on your bank and AdSense account, but the bank may verify these addresses while processing the wire transfer. If the two addresses don’t match, your payment might get delayed. Thus, it is recommended that you update either of the two addresses and make them identical. What are the fees charged for processing wire transfer payments? Google pays most fees associated with sending payments via wire transfer and you won’t be charged any of it. However, your bank may charge you a small fee (Service Tax on Foreign Currency Conversion) for the USD to INR conversion that it performs before crediting the amount into your account. Also, if your bank uses the services of some other bank to process wire transfer payments, an additional service fee might be charged by your bank. You should get in touch with the bank authorities for more information on fee assessment policies. As stipulated by the Government of India, any conversion from one currency to another, both incoming and outgoing will be charged a service tax on the gross amount of currency exchanged as per the following slabs. In addition, an education cess of 3% will be levied on the service tax levied. This includes 2% education CESS and 1% higher Education CESS. Which is the best bank for receiving wire transfer payments? Even though Google usually pays most of the fees related to wire transfer payments, your bank may still levy a variable service charge for currency conversion. The amount of service charge imposed is decided by the bank, and this amount might impact greatly on your AdSense earnings. Thus, you should make sure that the bank chosen for receiving AdSense payments is profitable for you. Low Service Charges: Banks in India will generally charge you a fee for USD to INR conversion. The lower the fee charged the better. Higher Conversion rates: Conversion rate determines how much INR is credited to your bank account per USD of the issued payment. The higher the rate the better. Payment Amount: Payment amount is a key deciding factor for selecting your most suitable bank. Suppose bank A is charging a greater processing fees than bank B; but at the same time, also providing a higher conversion rate. In such a case, if your payment amount is low, bank B might be a better option; but if the payment amount is high, bank A’s higher conversion rate might be a significant advantage over bank B’s lower fees. Processing times: Some banks may take less time to process wire transfer payments compared to others. This is not one of the key priorities, but if you really wish to get paid quicker, try to find out which banks process wire transfer payments faster. If you have multiple bank accounts, change your AdSense Account details accordingly to receive payments across different cycles in different bank accounts. After you have tried wire transfer payments in all your accounts, it’s up to you to decide which bank is more profitable for you. However, if you are ready to open a new bank account, refer to the links below to find out the conversion rates and processing fees used by banks across India. These links will give you a rough idea about which bank is providing a higher conversion rate. However, the projected conversion rates and service charges mentioned in these links may vary from the actual figures used by the banks. It is recommended that you get in touch with the preferred bank for confirmation on the actual figures. “Payment method” is now known as “Form of payment”. “Unpaid finalized earnings” is now referred to as “Current balance”. Transaction history table now lists the latest activities on top (redesign). New toolbar added that allows you to filter, print, export or download transaction details. You can choose any custom payment threshold greater than the current default threshold value. Hold payments till a specific date feature introduced. Centralized locations to manage your Payment settings and Payee profile. All new earnings and future will be available in the new Payments page. Previous earnings details will be available in the Previous Payments link at the bottom of Payments page. The bank account number field of the AdSense form could initially accommodate up to a maximum of 16 digits, but according to the Reserve Bank of India, any bank in India may have an account number up to 18 digits. A new system has also been proposed (IBAN) which could extend bank account numbers up to 26 digits long. This issue has been recently fixed by the AdSense team and the account number field currently supports up to 18 digits. The current UI does not let you edit the tax details (in the payee profile page), but Google AdSense team has verified that the option to edit it would be available soon. The new wire transfer payment system will soon be rolled out for all AdSense publishers in India. But before you begin using the new payment system, make sure you have all the right details. Hopefully, this article will provide you a one stop solution for all your queries related to the new payment system as well as the changes in your account settings. Nevertheless, if you still have other questions that were unfortunately left uncovered, don’t hesitate to post them in the comments section below. And if you find this information genuinely useful, spread the word to other Indian AdSense publishers.